Ryan Decker, Economist, Board of Governors of the Federal Reserve System, John Haltiwanger, Distinguished University Professor in the Department of Economics, University of Maryland, Ron Jarmin, Acting Director, U.S. Census Bureau, and Javier Miranda, Principal Economist, Center for Administrative Records Research and Applications. Originally published at VoxEU. When we think about what determines an economy’s productivity, typically what comes to mind are technology, workforce skills, or management practices. But an important determinant that receives less attention is resource allocation. Market economies continually reallocate resources, such as workers, to more efficient patterns of production and exchange. For example, behind the net job growth numbers are the flows of jobs between businesses. This job reallocation is the sum of jobs created by expanding (and entering) employers, plus jobs destroyed by those that are downsizing (and exiting). A high pace of job reallocation is costly to workers and firms, but it reflects continual movement of resources away from low-value or unproductive activities toward higher-value ones. Distorting or slowing down this process can have a negative effect on productivity. We find evidence that this process has slowed down noticeably since the year 2000, with an implied drag on aggregate productivity. Previous research has found a decline in the pace of job reallocation in the US since the early 1980s. Causes include changing patterns of worker turnover (Hyatt and Spletzer 2013), reduced migration (Molloy et al. 2017), an ageing work force (Engbom 2017), and less entrepreneurship (Decker et al. 2014). Figure 1 shows job reallocation for selected sectors. A striking feature of reallocation data, which we highlight in Decker et al. (2016), is the contrast between the overall economy, in which reallocation has declined steadily for decades, and the high-tech sector, where reallocation was flat or rising before it began declining in the 2000s. Source: Authors’ calculations from Longitudinal Business Database. Notes: HP trends using parameter set to 100. Industries defined on a consistent NAICS basis. High-tech defined as in Hecker (2005). Includes all new entrants, continuers, and exiters. Job reallocation is costly for firms and workers, so a decline in reallocation may improve welfare. In the retail sector, for example, the shift from ‘mom and pop’ firms to retail chains has led to greater firm stability and higher productivity. Other shifts in business model may have similar effects. On the other hand, evidence suggests that much reallocation is increases productivity, so whether the patterns of reallocation in Figure 1 have been detrimental to productivity depends on what caused them. Fewer or less-intense shocks. Each business responds to shifts in productivity and profitability conditions or opportunities. This response includes job creation and destruction. A decline in reallocation could therefore mean the dispersion or intensity of idiosyncratic shocks faced by businesses has declined too. Idiosyncratic shocks might reflect different realisations of technical efficiency or relative demand for products across producers. A decline in the dispersion of these shocks might be roughly benign for overall productivity. It may even increase welfare by reducing the need for workers and firms to make costly changes. Increasing costs and frictions. Since the pace of reallocation reflects the responsiveness of businesses to their environment, an increase in costs or frictions that inhibit business expansion or contraction will reduce overall reallocation. If reallocation declines for this reason, this is likely to reduce living standards, because it traps resources in unproductive businesses. Holding frictions constant, a decline in the dispersion of shocks implies lower dispersion of measures of business-level productivity, such as revenue per worker. A rise in labour adjustment frictions implies a weaker relationship between employment growth and productivity at the business level, and also an increase in dispersion of revenue per worker across businesses. If productive businesses become less likely to add workers and unproductive businesses become more likely to hoard workers, revenue per worker rises for productive firms and declines for unproductive firms, increasing overall dispersion. Source: Authors’ calculations from the RE-LBD. Notes: Standard deviation of log labour productivity deviated from industry-by-year means. Young firms are less than five years old. High-tech is defined as in Hecker (2005). NAICS 52 and 53 omitted. If dispersion of productivity across firms has risen, this contradicts the hypothesis that the dispersion of shocks has changed and supports the hypothesis that the responsiveness of businesses has weakened. We focus on the manufacturing sector, constructing estimates of TFP at the establishment level to study the employment growth responses of businesses. Figure 3 shows the employment growth response differential between high-productivity establishments – those that are one standard deviation above the mean within their industry – and establishments at the industry average for productivity. We calculate this for different types of businesses (young and mature, high-tech and non-tech) and different time periods (1980s, 1990s and 2000s). During the 1990s, employment in establishments of high-tech young firms that were one standard deviation above their industry’s TFP average grew by 16 percentage points more in a year than the industry average. More generally, productivity responsiveness among high-tech businesses rose from the 1980s to the 1990s then fell during the 2000s, mimicking the pattern of job reallocation in the high-tech sector over the same period that we saw in Figure 1. Outside high-tech, productivity responsiveness declined throughout the period, consistent with the aggregate reallocation series. This supports for the responsiveness hypothesis. Source: Authors’ calculations from the LBD, the ASM, and the CM. Note: Young firms are less than five years old. High-tech is defined as in Hecker (2005). Growth rate of plant with TFPR one standard deviation above industry mean vs industry mean. Rising labour adjustment costs and frictions are not the only potential explanation. An increase in market power of firms or rising prevalence of winner-takes-all competition would be likely to reduce responsiveness, but it would not affect productivity dispersion in standard models. If technological diffusion across firms was slower (as argued by Andrews et al. 2015), this may produce rising dispersion of output per worker, but slower diffusion alone would not explain weakening business-level responsiveness. Weakening responsiveness implies slower flows of resources to productive businesses, a significant implication for aggregate productivity. We conduct a simple counterfactual to estimate the magnitude of these productivity effects. Using our business-level microdata, for each year we estimate the aggregate productivity from the estimated responsiveness coefficients in Figure 3. Then we compare this aggregate estimate with an estimate in which productivity responsiveness was held constant at its strength in the early 1980s. There is higher aggregate productivity in the ‘constant responsiveness’ scenario by the end of the period, because it allows the most productive businesses to acquire more resources. Figure 4 shows the difference between these scenarios, for both high-tech and non-tech manufacturing. Source: Author calculations from the LBD, the ASM, and the CM. Notes: Figure depicts diff-in-diff counterfactual from TFPR concept. High-tech is defined as in Hecker (2005). To interpret Figure 4, consider the high-tech line in 2010. 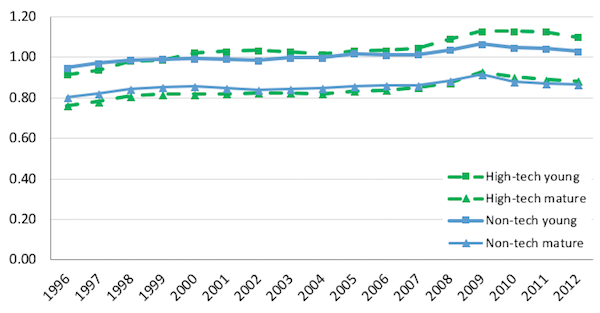 The value of -0.02 implies that, given the actual distribution of establishments’ size and productivity in 2009, aggregate (industry) productivity in 2010 would have been about 2% higher if productivity responsiveness were still at 1980 rates. 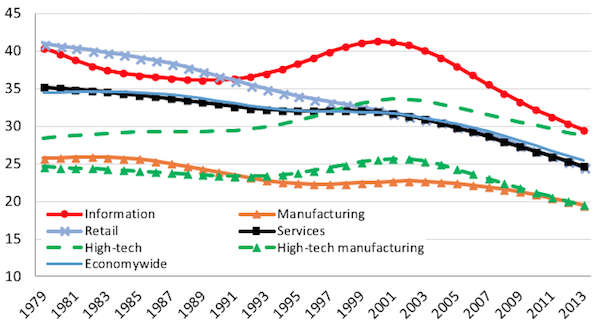 More generally, the line for high-tech is positive during the 1980s and 1990s, as responsiveness rose (see Figure 3). Rising responsiveness was boosting productivity through improved job allocation. In the 2000s, declining responsiveness became a drag on aggregate productivity. This timing is similar to the timing of US productivity growth generally. Fernald (2014) documents the productivity acceleration of the late 1990s and slowdown of the mid-2000s, which was concentrated in IT-using and producing industries. We also find similar results for non-manufacturing industries (based on labour productivity instead of TFP). Moreover, within high-tech manufacturing we find that the responsiveness of capital investment and establishment exit follow similar patterns, suggesting that the trend of weakening productivity selection is general, and we find that the change in responsiveness was not the result of composition effects. We find no evidence that this slowdown in reallocation-driven productivity growth has been offset by stronger within-firm productivity growth. Discovering the cause of changing patterns of job reallocation is important. These patterns have significant implications for aggregate productivity and living standards. Our investigation suggests that researchers should focus on potential sources of rising adjustment frictions. These could include any policies or other factors that raise the cost of, or reduce the incentive for, hiring and downsizing. Authors’ note: We thank Cathy Buffington for helpful comments. Any opinions and conclusions expressed herein are those of the authors and do not necessarily represent the views of the US Census Bureau or of the Board of Governors of the Federal Reserve System or its staff. All results have been reviewed to ensure that no confidential information is disclosed. This entry was posted in Economic fundamentals, Guest Post, Income disparity, Macroeconomic policy, The destruction of the middle class, The dismal science on July 12, 2018 by Lambert Strether. maybe the “resource” just doesn’t want to move, or can’t afford to. It’s like going on strike while still going to work. Note: This article makes some good points at the beginning, and then it turns into a bunch of platitudes. Note: Caps were in the original quote. A high pace of job reallocation is costly to workers and firms, but it reflects continual movement of resources away from low-value or unproductive activities toward higher-value ones. I was speaking with a friend about this recently. We’re both engineers in the automotive sector and would both be happy to spend our days to plying our trade working on making the world more resilient to the cascading impacts of climate change, or designing more robust, lower-impact transportation systems. But there are a whole lot of companies eager to hire people to build completely unnecessary vanity accessories for rich people and essentially none working on things that would benefit the population at-large, so it seems that “high-value” is a bit of a misleading term. 1. Finding people who can read, rite, ‘rithmetic is getting harder. Much of the work that needs to be done requires a solid middle school or high school education, but many people do not have that level of competency. 2. I work in an industry where drug testing is common for initial employment, after incidents like car accidents, or random drug tests. Many people flunk one of these which makes them un-hireable at any wage or immediately boots them from the job. 3. Companies want everybody to “have experience” or “the appropriate credentials”. The companies are not willing to hire inexperienced with solid high school skill levels and train them for the job. They are willing to forego future revenue in order to avoid that short-term cost. I think this is related to share buyback mentality which allows you to grow without growing by investing in stock buybacks instead of the company. Another challenge is that the 1980s-90s “tough on crime” era has criminalized a high percentage of the population making them less palatable to employers for a variety of reasons. The US is the most incarcerated country in the world. The “ban the box” movement is a good one but appears to be slow to catch on. I started to lose interest in the second paragraph beginning “Market forces.” I was expecting a qualifier like “in theory” or “in an ideal world.” But the writer seems to believe that the economy actually functions like that. While this is an interesting and intelligent post, I think that it misses the big picture. What causes high productivity? Answer: high wages. And what causes high wages? No, it’s not high productivity: it’s a tight labor market. When labor is relatively scarce compared to demand, labor becomes a limiting factor and businesses invest in making more efficient use of that labor. When labor is abundant and cheap, they don’t, because they don’t have to. At the bottom of Niagara Falls, water is plentiful, and cheap, and nobody cares if they spill a few gallons. In the middle of the Gobi Desert, water is scarce, and expensive, and people invest in making efficient use of it. Now tell me: is water valuable in the Gobi Desert because it is scarce, or because people are making efficient use of it? Well? And what does declining productivity say about automation and robots taking over human jobs? Of course, it says that this meme is rubbish, it simply can’t be true overall or productivity would be skyrocketing. When human labor is cheap and disposable productivity will be stagnant. Because supply and demand. Yep. Why invest in machines when you have a pool of low-wage workers? That is why you still have sweatshops making clothes and other goods. I suspect that one of the reasons we had strong productivity growth in the period from 1945-1973 was because wages were high so it made sense to invest in labor-saving machinery. And contrary to the automation meme the period from 1945-1973 was one of low unemployment. There was no “robot apocalypse” despite strong productivity growth. That seemed to be my boss’ prime directive…..
Livius- I have read some of Seymour Melman’s work and your and TG’s comments reminded me of a post about Melman on NC a while back. An economic ‘virtuous cycle’ emerges if you pay workers more, because competent managers will compensate for higher wages by using more and better machinery, and by improving the way work is organized, which will then lead to higher profits, which can lead to higher wages, leading to better machinery/organization of work, and so on. Indeed, Melman even argued that if you have strong unions, management will be forced to figure out more clever ways of organizing work than just trying to decrease wages. When wages go up faster than the price of the machinery that is being produced by workers, then this ‘virtuous cycle’ is reinforced. Melman followed this ratio in various countries starting in the 1950s. For instance, in his last published book ‘After Capitalism’ he noted that the Japanese and Germans were increasing wages at a higher rate than the increase in their machinery prices, and their machinery industries were world-leading and their workers made more than their American counterparts. In America, on the other hand, machinery prices were going up faster than wages. So cutting or stagnating wages reverses the ‘virtuous cycle’ of increasing wages leading to better machinery and organization of work. This dynamic was one of the themes of Melman’s first book, ‘Dynamic Factors in Industrial Productivity’. Seems to make sense. The German’s have or had a culture of “German Engineering” excellence and take pride in their engineering and industrial economy. Once upon a time the US seemed to have that same pride in engineering and industrial competence. But with the advent of the consumerist consumption, planned obsolescence, and low cost culture and the rise of neoliberalism that industrial and engineering ethic is dying. Now we get GM cars and trucks with ignition switches that fall off. Not that it is strictly a US phenomenon as the Takata Air Bag scandal shows. Seems to me that the author doesn’t address the issue of efficient resource allocation in a meaningful way, because his definition of productivity is not valid. A strictly sell-side measurement focus of productivity, as was done in this article, is incomplete. For example, there is no mention of output quality of that which is produced from the consumer’s perspective. My own first-hand experience running a service business tells me that this type of sell-side only focus on productivity eventually leads to lousy service, customer dissatisfaction, and ultimately to a “reallocation” away from my firm to another firm. Wrong word…should have used the word “profits” instead of productivity. Again, where do you factor in decreases in quality that usually result from reallocations of investment towards sellers who focus upon achieving the lowest price. (e.g. those of us that have been around a while know there’s no comparison in life spans of appliances made in the last 10-20 years to those manufactured 40 years ago). Getting a better measure of productivity by also factoring in changes in quality (not just price) over time is apparently too difficult. So, the rule seems to be -ignore if you can’t quantify…because the math is easier. I think the rise in reallocations for the tech sector as shown on your chart in the mid- to late 1990s had more to do with stock market distortions. Recall the proliferation of phony-baloney tech start-ups that initially received huge valuations that were subsequently shown to be worth nothing more than the paper their business plans were written on. We need jobs dedicated to creativity, not productivity. But the pitfall is that creativity will be defined by whoever “controls the narrative.” This post was just sooooo boring that I finally figured it out: Neoliberal economics has constructed a prison of malaise – a universal dead-end; a bubble of suffocation that no creative energy can escape. Not even a fart. I just went brain dead. Must go nap. In the meantime I remain hopeful that somebody will come up with a logical definition of “higher value”. The world is improved by a good nap. Automobiles replace horses so blacksmiths need to become auto mechanics or find something else to do if they want to keep working. If they dont switch what effect does that have? The productivity increase happens by getting rid of the horses not from blacksmiths switching jobs. One might consider the possibility that responsibility for the decline in productivity lies not with labor but with the corporate media’s self-labeled “elite” comprised of the One Percent, CEOs, senior Wall Street bankers, their bought-and-paid-for politicians and neoliberal economists at their various “think tanks” and universities who have through their “financialization” of the US economy and austerity policies thrown American labor down the Loo for their own excessive financial benefit to the exclusion of all other considerations and are now finding the bill has come due as vast swaths of the American economy lie baking and dormant in the heat and humidity of mid-summer 2018. I mean why aren’t we discussing the current diversion of trillions of dollars in funds from corporate operating cash flows and incremental debt proceeds into corporate stock buybacks rather than those funds flowing into productivity-improving expenditures and R&D? So the decline in productivity is being ascribed to a failure of will; i.e., “the responsiveness of businesses has weakened”; a reluctance to do layoffs is behind the declining productivity and If we just return to the policy of layoffs that we used before, the lack of layoffs that created this decline in productivity will be reversed and rising productivity restored to its rightful place on the mantle. This is true, but it is irrelevant to the “Job Creators” who worship Free Market Capitalism and think that the reforms that ended Dickensian Britain were bad. They like being the Lords of Creation; the Job Creators using their wealth control federal, state, and municipal governments who then change the laws for their enrichment and everyone else’s immiseration. If the proles gets ideas, there’s the police state. I have come to believe that a strong impetus of some of the elites to create these horrible conditions is the feeling of superiority that they get. Michael is a Marxist economist who argues, with evidence, that capitalism has been experiencing a ‘falling rate of profit’ since the mid 1960s, which goes to the heart of current economic, and therefore political issues, including labour productivity. I urge you look at his stuff, and read his books. BTW I don’t know Michael, I just think he is right!